While I ate this freshly baked, just allowed to be cooled at room temperature; it tasted just as delicious from the fridge as well. (When devouring the leftovers next day). It is more about personal preferences. It is after all the "texture" of the cheesecake that continues to change at each temperature you eat it at. The phyllo chips that I speak off in my recipe, are a different matter. They are best when served freshly baked and on the warmer side of room temperature. Once refrigerated they tend to become rather moist and loose their crispness very quickly. However, I had none left over to worry about; as everyone had snapped them up! While the process from start to finish does seem a tad lengthy and time consuming to prepare, it is reasonably simple. The organising and preparing of the ingredients and allowing for a couple of hours within the vicinity of the kitchen will help. I can happily share that I was pleased with the end result; taking this opportunity to thank my creative food artist friend Kainaaz, (who lives just 7,750 miles/12500 km away), for bouncing off such fun ideas. A cheesecake that is layered with the flavours of a baklava. These phyllo chips were a huge favourite so don't skip them. Press it down on the base. It will look like a large biscuit. Pour over the cooled base and bake in the same preheated oven of 350 F/ 170 C for 10 minutes and then reduce to 300 F 140 C for another 35 minutes. Check that the center is jiggly and sides are just set. Turn off the oven and allow to cool for another 30 minutes or more. Remove. Scrape the sides down, open up the spring form and move to a plate once completely set and cool. To finish off bake the phyllo sheets as follows. Place the phyllo on a cookie tray and brush the bottom half with a mix of melted butter, saffron and a squeeze of fresh lemon. Sprinkle it with the mix of sugar and pistachios. Fold down the half and repeat to brush sprinkle and refold the phyllo sheet. Repeat the process with the second sheet of phyllo. Place both on the baking sheet and cut into triangles with a pizza cutter or a knife. Sprinkle both the sheets with the remaining pistachio mix. Bake for 12 minutes, remove the tray turn all the pieces over. Return the tray into the oven and continue to bake for 3-5 minutes until lightly golden. Using the crumbs on the baking tray for the center of the cake sprinkle it over. For making the 'red' either add dry edible rose petals, pomegranate seeds, or simple colour a teaspoon full of the phyllo crumbs with red food colouring by dropping it into a bowl and tossing it until red. Place the shards of phyllo all around and serve. 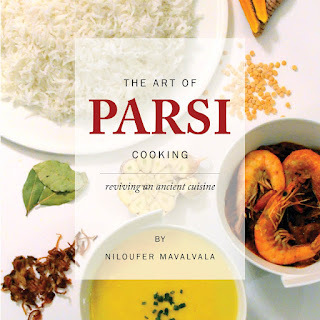 For Parsi Food recipes an its history and origins click for the cookbook The Art of Parsi Cooking; reviving an ancient cuisine.